I got some new Nabi polishes last week from a discount cosmetics shop on the other side of tow.n. Here is a spectacularly crappy photo of them taken on a piece of paper on top of the BBQ out the back! That's right, no fancy light box for me, your lucky there's not grease spot showing through the paper :). I've been so into glitter polishes recently. Every time I go to put something on I pick up a glitter bottle and work out what I can match it with. This combo is Nabi 'Gold Big Ball', which is most certainly a Chinese import and not three free from the smell of it. Ohhhh I love the smell of toxic nail polish! Gold Big Ball has three sizes of gold hex glitter, with smallest and largest pieces being holo gold glitter! 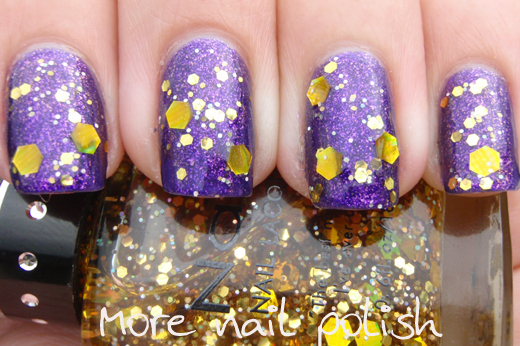 Yell yeah, super sized gold holo glitter! 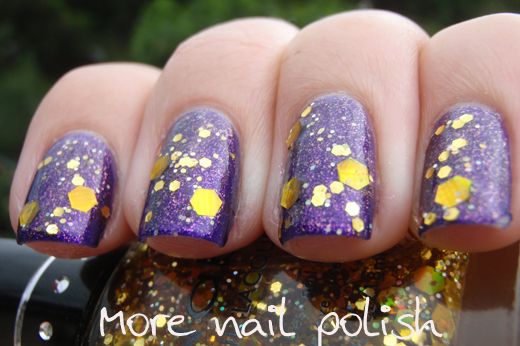 I layered one coat of Nabi gold big ball of two coats of Zoya Mimi. Application of the glitter was a bit tricky and I did need to search for the glitter pieces in the bottle and roughly place them on the nail. But the final look was definitely worth it. I wore these nails to work on Thursday (I know, totally work appropriate right!) At the end of one meeting with some ladies in another division, one of them leaned over to me an said "Seriously, your nails were so distracting during that meeting". How cool is that! I'm used to distracting myself with my nails, but I love it when I can distract someone else too! I love the combination. No wonder she was distracted! 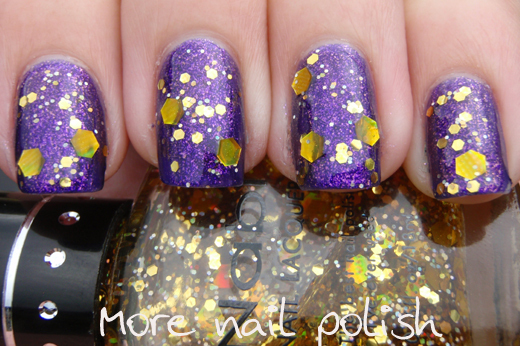 I adore big chunky glitter! I'm glad I'm not the only one that loves getting complimented on their nails. WOW! 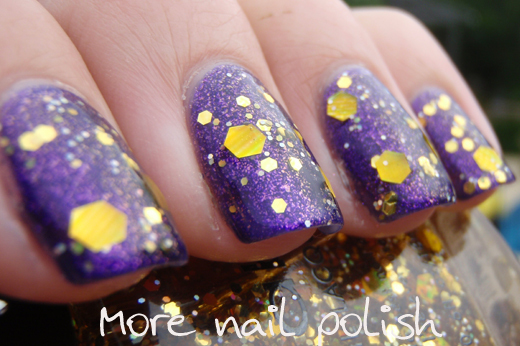 I love gold and purple together and this looks amazing! 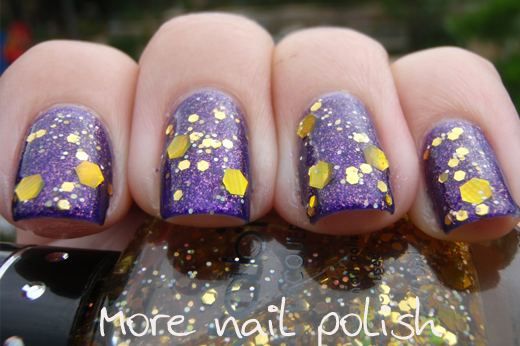 Love the gold ad purple combo, and the big glitter are soooo prety ! 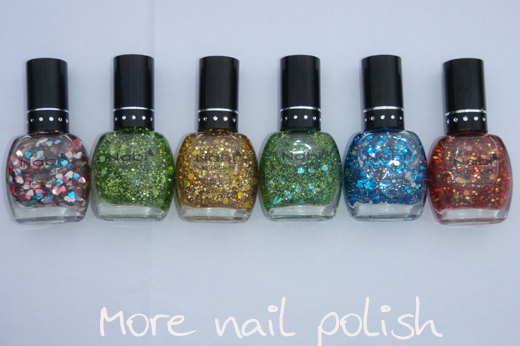 I have the first polish bottle in the pic you posted above.. it smells horrible but the glitters are cool! Lol...I hear ya on the work distraction! Love that mani!